When you think of Idaho and farming, I bet the first thing that comes to your mind is potatoes. Idaho is certainly known for their spuds. But what you might not know is that they are also the birthplace of the Ida Red apple. This apple which was born from combining a Jonathan with a Wagener has a nice white flesh and red rosy colored skin. They are harvested near the end of September to the beginning of October. Overall Feeling: This is one of my favorite baking apples. It has a nice flavor and a good amount of acidity. I love using them to make fried apples. 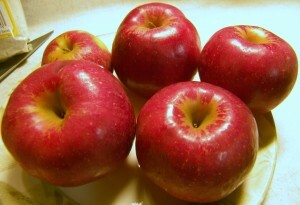 They would also be a great additional to a pie and can add acidity and flavor to applesauce. I don’t really like to eat these apples out of hand. The ones I picked directly from the trees in years past have been too tart for me to just eat them as is.